Earlier in the summer I was lucky enough to make contact with Claude, the mastermind behind the beautiful “Henri et Victoria” men’s grooming line. To date, I had tried and reviewed a number of their products. Every time being impressed, if not flat out just knocked out! The Cognac and Cuban cigar hair pomade, the companion roll-on cologne and more recently the Absinthe after shave splash and cream. All of which were more impressive than the last. 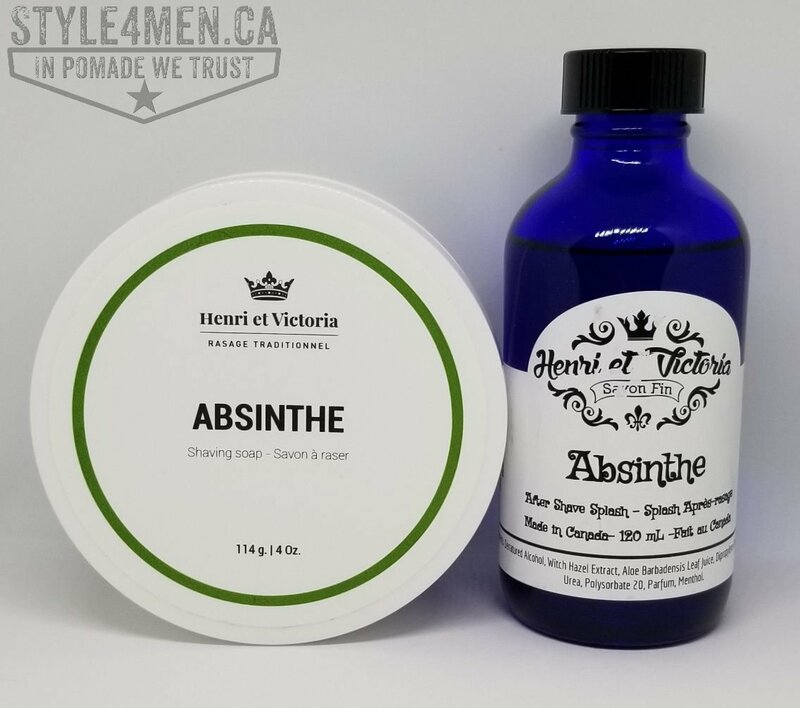 Sometime in April-May I got to try the “Henri et Victoria” Absinthe after shaves, but I had not had the opportunity to try their shaving soap of the same aroma. Actually, I had never tried any of their shaving soaps. Yes, I know: what a shame! How can I be claiming to “try it all”?! Tssss! So here we are with a nice jar of the Absinthe shaving soap. First things first, absinthe is a beautiful and unique aroma. 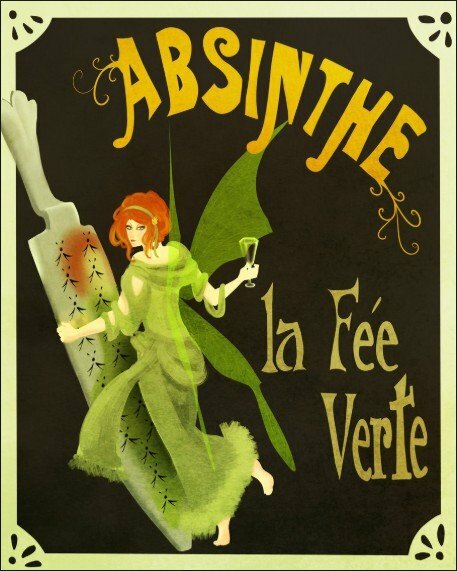 Absinthe is also a liquor known as “La fée verte” or the Green Fairy. We are not talking about Tinker Bell. There is a bit of a tumultuous story being Absinthe. Delirium and prohibitions are some of the highlights. The closest thing that comes to mind in an effort to describe it is; black licorice. But, it is considerably more subtle and certainly more refined than convenience store licorice. What is most surprising is how well this scent comes out when wearing it in an after shave. It turned out to be an absolute favorite this summer. I have written this many times, but there seems to be some relevance in mentioning it again: exploring the fragrances concocted by Artisans is a fiesta for the nose. 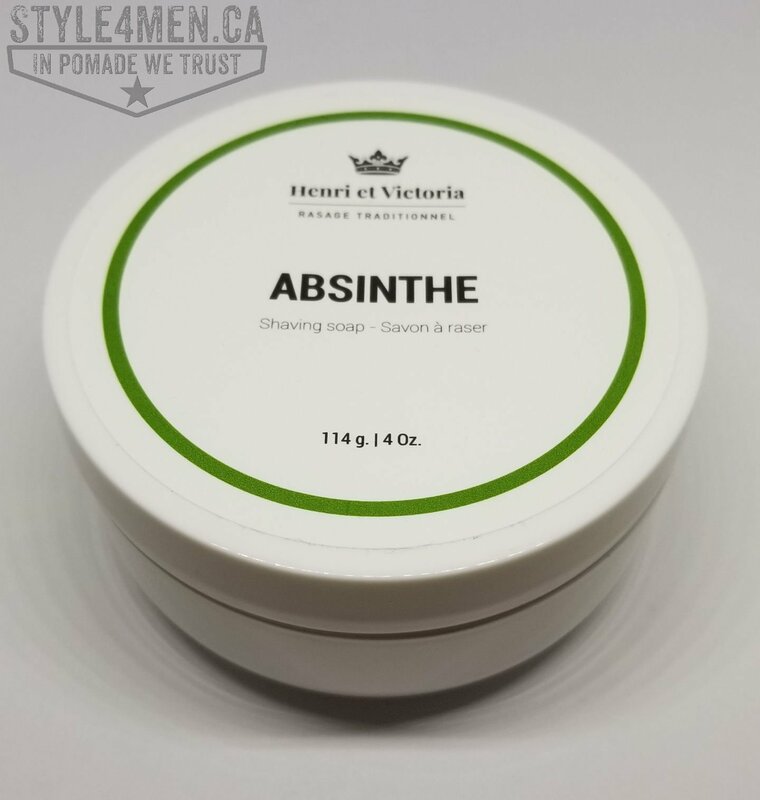 For the purpose of this review, I shaved roughly 2 weeks straight using only the “Henri et Victoria” Absinthe shaving soap and after shaves. 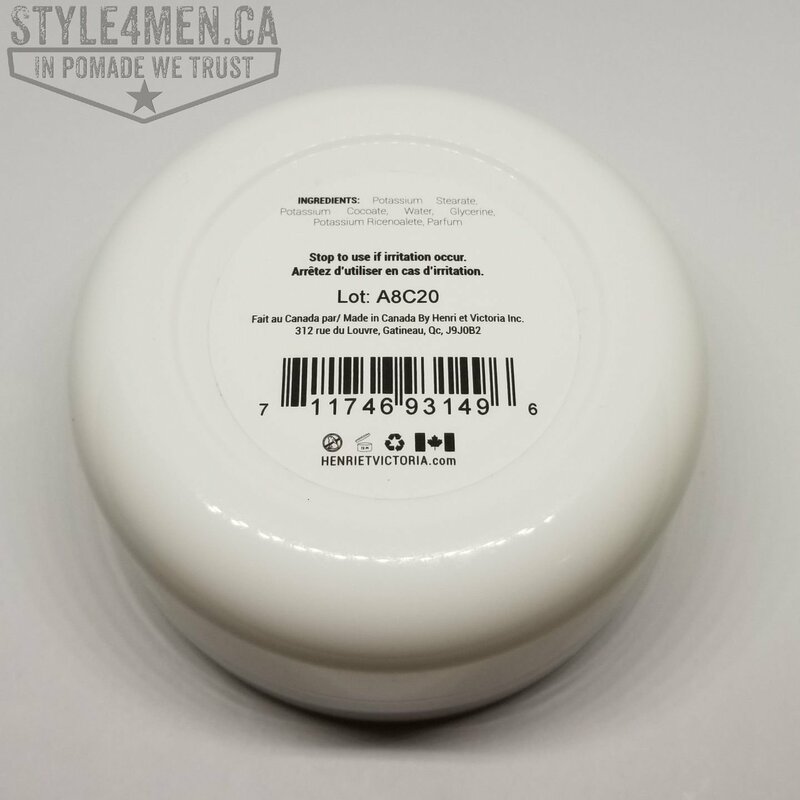 The soap comes in a nice 114g plastic jar with a screw on lid. This might seem like an insignificant detail, but when it comes down to it, having that jar and lid seriously simplify the experience/usage and storage. Being able to close the lid also preserves the soap in better condition. Another nice detail is that when you open the jar, the soap is already slightly shaped in a funnel. This allows for the brush to easily be worked in circles without having the foaming soap overflow. It is a worthy detail as this soap does produce a beautiful lather. Nice and thick! The aroma is clearly that of the above described licorice, but since this is the shaving soap it has less staying power. I found it easy to lather up and apply as it stuck well to the skin. Onto the shaving! Having a good and uniform coverage I turned to my trusted Rockwell 6C with plate No. 2 and my favorite VOSKHOD platinum blades. A lovely experience! As with all shaving soaps, the passage of the blade removed most of it and if a second pass was required, I either had to add a touch of water or a new soap application. 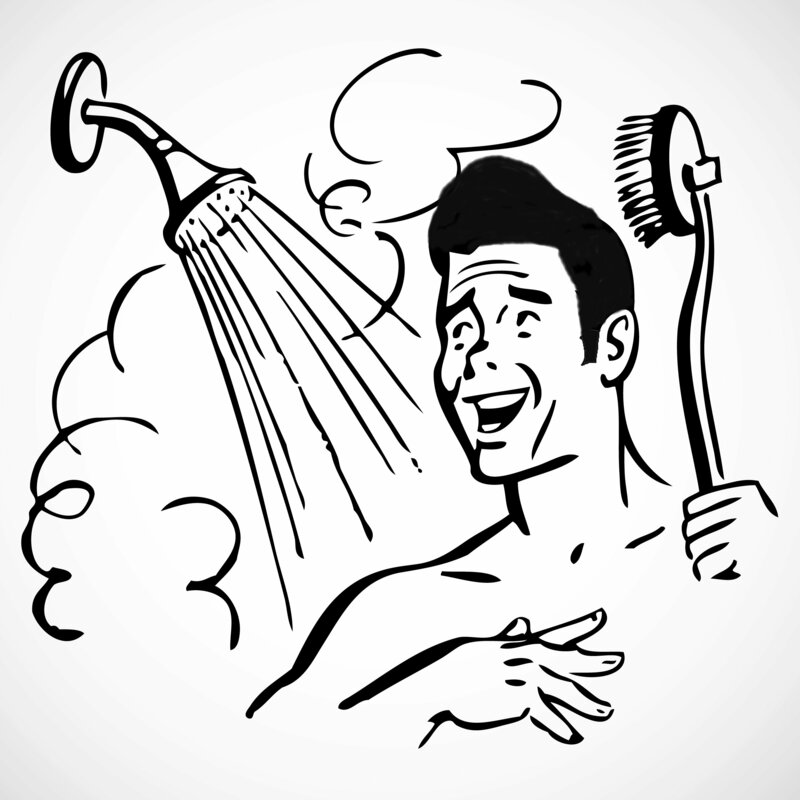 Keep your pre-soaped brush close by, as any experienced wet shaver will know. A shaving soap, cream or foam essentially has two tasks: insulation and lubrication. Insulation, to trap the moisture in and lubrication to help the blade glide smoothly on your mug. For insulation this soap did perfectly. For lubrication it did very well but I felt it could have had a touch more oil. Obviously this is a very personal detail and my skin could have been a touch dryer during these test weeks. In order to remedy to this situation, I added a bit of pre-shave oil to my ritual. At first I was using the one from IMPERIAL which had been a bit of a rediscovery for me earlier in the year. Then I moved onto a pre-shave oil of my own making. Check it out on Instagram. In both instances, the overall shave experience was tremendously improved. Over time and with repeated usage of drying agents such as soap and alcohol based after shaves, one has to expect that the skin will become dryer and adding a lubing or moisturizing agent to the mix becomes important. The information to retain here is that the soap and after shave were not the least affected by the introduction of the pre-shave oil. No reactions, irritations or redness. I should also mention that “Henri et Victoria” has just undergone a re-branding, where they have moved from their “Victorian” (pardon the pun) logo to a crisp and more modern presentation. Their web site has also been redesigned and it should be easier for you to find what you are looking for. The after shave bottle below is in the original labeling. What I liked about this shaving soap is that it is a full product set: shaving soap and after shaves. The ingredient list is short and sweet with no naughty chemical participants. It comes in a convenient tub. The smell is divine. It is easy to whip off. 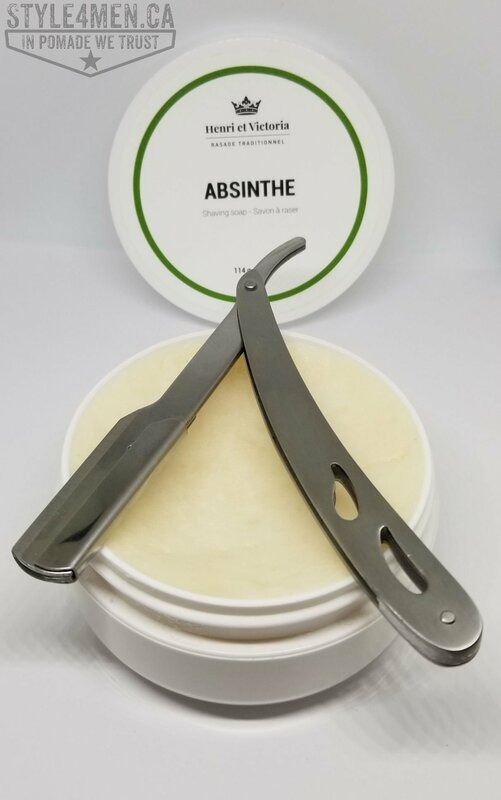 In closing, if you are looking for a high quality shaving soap with a unique fragrance that also has the after shave supporting products and that is produced locally, then this soap will but a smile on your mug.